A sinking self-propelled semi-submersible vessel was interdicted in the Western Caribbean Sea March 30, 2012 by the crews of the Coast Guard Cutter Decisive, Coast Guard Cutter Pea Island, Joint Interagency Task Force South (JIATF-S), and the Honduran Navy. The cutter Pea Island and Decisive's pursuit boatcrews interdicted the SPSS and detained four suspected smugglers. The SPSS sank during the interdiction in thousands of feet of water. U.S. Coast Guard photo. The crews of the Coast Guard Cutter Decisive, Coast Guard Cutter Pea Island, Joint Interagency Task Force South (JIATF-S), and the Honduran Navy interdicted a drug smuggling, self-propelled semi-submersible (SPSS) vessel in the Western Caribbean Sea March 30. 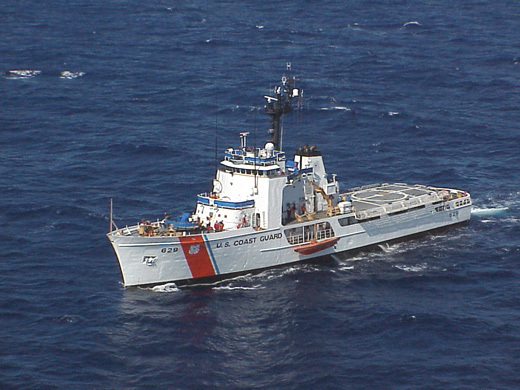 SPSS vessels are used regularly to transport illegal narcotics in the Eastern Pacific, and this interdiction is only the fifth Coast Guard interdiction of an SPSS in the Caribbean. The Coast Guard’s first interdiction of a drug smuggling, SPSS vessel in the Western Caribbean Sea happened July 13, 2011: http://tinyurl.com/bouggn2. A Coast Guard Air Station Miami aircrew, working in the Caribbean in support of JIATF-S Operation Martillio, spotted a suspicious vessel and notified 7th Coast Guard District watchstanders of the location. The cutter Pea Island and Decisive diverted to the given position. The cutter Pea Island and Decisive's pursuit boatcrews interdicted the SPSS and detained four suspected smugglers. The SPSS sank during the interdiction in thousands of feet of water. "Medium endurance cutters like the Decisive are built for multi-week offshore patrols including operations requiring enhanced communications, and helicopter and pursuit boat operations," said Capt. Brendan McPherson, 7thCoast Guard District chief of enforcement. "When combined with patrol boats like the Pea Island, which has superior speed and flexibility, it helps us and our partners to provide the Coast Guard's unique blend of military capability, law enforcement authority, and lifesaving expertise wherever needed to protect American interests." Built in the jungles and remote areas of South America, the typical SPSS is less than 100 feet in length, with four or five crewmembers, and carries up to 10 metric tons of illicit cargo for distances up to 5,000 miles. Drug traffickers design SPSS vessels to be difficult to spot and to rapidly sink when they detect law enforcement, thereby making contraband recovery difficult. The U.S. Coast Guard, U.S. Navy, Customs and Border Protection, and partner nation aircraft and vessel crews work together to conduct counter drug patrols in the Caribbean Sea. The Decisive is a 210-foot medium endurance cutter homeported in Pascagoula, Miss. The Pea Island is a 110-foot patrol boat homeported in Key West, Fla.
thank you coast guard for guarding our seas.